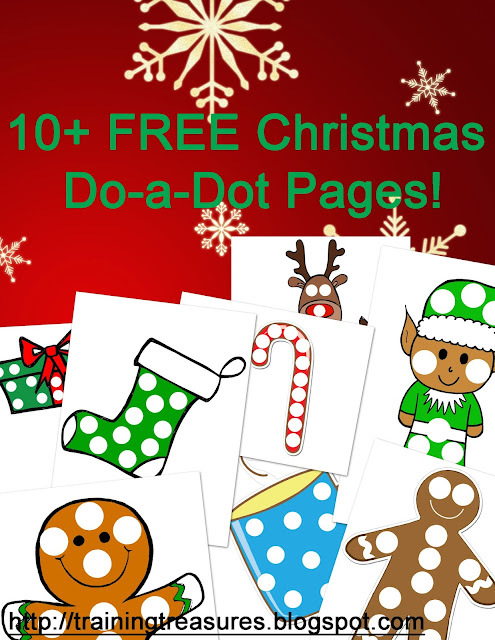 Training Treasures: 10+ FREE Christmas Do-a-Dot Pages! Are YOU ready for Christmas? In years past, I have been finished with all of my Christmas shopping by AUGUST. Last year, we finished on Christmas Day (seeing as how my husband was building my boys a kitchen from scratch). But the majority of the shopping was done in October! But this year . . . ? I am 8 and a half months pregnant, my kids don't need a single thing, and I am preoccupied with other things (like homeschooling two boys and this blog). As sad as it is to say this, I haven't bought a single Christmas present. In fact, my son turns 3 in 2 weeks, and I bought him 2 things- a pair of shoes and a car. What about you? Are you an early or late shopper? And what about getting in the Christmas spirit? Are you already listening to all 8 Christmas songs (haha, just kidding)! Here is one way to get in the spirit of things! Visit my TpT store, download this file, and print out as many or as few of these Christmas Do-a-Dot pages as you'd like! I'd love to hear how you use them! Make sure you comment below! Are you liking all of these freebies? Make sure you subscribe by email, otherwise you'll miss out! Subscribers will be offered free printables right to their inbox!